You might think that there’s nothing in this world simpler than watering a garden plant. However, there actually are proper ways to water plants – ways that can make you conserve water and money while you’re at it. Here are some of them. Water your plants only when they need it — Even if your plants are full of moisture, they will no doubt wilt and get dry if they are exposed to extreme heat. This is normal. What’s not normal is if they wilt and droop at night or during the cool early morning. This is a sign that your plants need water. Use wastewater or greywater (water that has already been used at least once) when watering your plants — It is a good habit to collect rainwater, especially if you keep a plant at home or in your office. Rainwater has high acidity levels, so using them on your plants can help offset the alkalinity that they may have been exposed to after you used municipal water or greywater on them. Rainwater also contains nitrates, which are elements that plants need for proper and healthy growth, and some organic matter, for added nutrients. As for using wastewater or greywater on your plants, it is very self-explanatory that it would be more cost-effective on your part to water your plants with recycled water instead of water that is fresh from the tap. Don’t use sprinklers to water your plants — We understand that it can be a tiring chore to water plants by hand – especially if you have many plants and your garden is the size of a parking lot. However, don’t use sprinklers to water your plants. A sprinkler doesn’t make for an effective watering device as its reach cannot cover all of your plants’ bases. Invest instead on a soaker hose or a drip irrigation line. Water your plants deeply so that you won’t have to do it often — Don’t water your plants at just the leaves or the stems. Make sure that water reaches underneath them and into the roots so that your plants’ root system becomes strong. Also, wetting only the top inch or two of the soil can actually be bad for your plant, as the roots – which also want their share of water – will be encouraged to stick to the surface as opposed to going down into the ground. So how much water are we talking about to be able to water deeply? Start with one inch of water per week. This can increase as the climate becomes hotter. For every 10-degree increment over 60 degrees Fahrenheit, add an extra half inch of water. 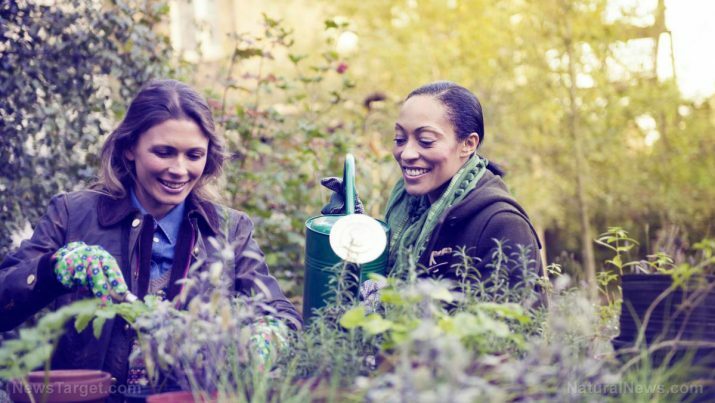 Watering deeply can also eliminate the need to water often, saving you time and money. Construct reservoirs or trenches near your plants — As a safety precaution for hot days, make shallow reservoirs or trenches around the bases of your plants for instant water-collecting devices. In the event that it gets too hot and your plants suddenly find themselves feeling parched, they can absorb the moisture from the shallow trenches and reservoirs near them and get respite from the water that you so carefully collected for them. Read up on more stories such as this one on Natural.news.